It's been a very fun two years, and I kinda wanna take the Cube out to celebrate its birthday, but I obviously can't do that, because it's, you know, not real. What I can do, however, is thank a bunch of people who have helped the Cube grow and talk about what you can expect from the Cube in the future. My family, who plugged this site to everyone they felt was interested, and even to some who didn't. Thanks go to them also for giving me a Comics Cube satchel and a Comics Cube shirt. And of course, thanks go to the Cube's Resident Kids, who offer the young perspective on various titles. My friends who supported the site from the very beginning, ensuring that I had 35 hits a day to start with, plugging it to people, and basically just helping me out. I could have never gotten it that big without you guys. You guys know who you are. An old college professor of mine who wishes to be called only "The Professor," who really gave me some good encouragement and tips when the site was starting out, and is still my main encyclopedia for comics history. Ty Templeton and Keiren Smith, the first comics pros to plug me and get me more exposure, and more, to actually talk to me. It means a lot. On that note, Budjette Tan, the first local creator to plug me, and also the most encouraging creator in the local scene. Thanks, Budj. Other creators, a little too many to name (but just to kick it off, David Hontiveros, Ace Enriquez...). Thanks to everyone who actually see me as a legitimate comic site that you'd actually plug me when I talk about you, and ask me to plug your stuff. Sandy Sansolis of Comic Odyssey, Eric Baga of Planet X, and the staff of Fully Booked High Street. Thanks for being awesome sources to buy comics from. The people who have influenced the way I write, the most obvious probably being Stan Lee ("Howdy, Cubers!"). The late Don Markstein of Toonopedia. My old high school English teacher, Mr. McTernan, who taught me everything I ever needed to know about setting down an argument and backing it up. And — and this is probably a surprise for some of you — Bill Simmons, the sports analyst, whose writing style has been a big influence on me in the last few months. Matt of Matt's Mentionables, who has helped give the site some awesome content over the years. Robert Leichsenring of She Is Screaming in the Shower, who offers a unique perspective to comics-related issues. Ben Smith, aka Back Issue Ben, whose columns continually remind people that comics are fun, that there's a wealth of material out there, and whose enjoyment and passion for comics of his youth make people want to read more of them. Comic book creators, of course. Without them, I'd have nothing to talk about. But I'd like to thank two of my favorites — Alan Moore, my favorite writer; George Perez, my favorite artist — the latter of whom got me interested in comics in the first place and the former of whom kept me that way. Of course, to all my readers — the followers on my Twitter and on my Facebook, and those of you readers who aren't on there! Thank you for taking the time to read the site. This site, obviously, would be pointless without you. And of course, to my now-wife, the Tulip to my Jesse, Peachy, without whose love, support, and encouragement, I would never have even started the site — much less kept it going. And now, for a bit of a refocus and a mission statement. In the last several months, I've been having a hard time writing articles for the Cube. I could blame that on a variety of factors — getting married, changing priorities, too much work — but after much reflection, what it really comes down to is that I lost focus. There's a direct correlation between how "good" the articles end up being and how much fun I actually have writing it, and my best articles — the stuff I built the site on — have always been the analytical ones, the historical ones, and the technical ones. In recent months, I made the mistake of trying to be a news site. As a result, the Cube has been less fun for me to write, and probably also less fun for you to read. Given that, I've set aside a few rules for myself going forward. I will not talk about creators' rights. A while back, I wrote a rather inflammatory post about creators' rights. I have since deleted it, but not before it sparked its share of hits. Going to Daniel Best's site and actually reading the legal documents and all the nuances of the situations really made me realize how things were not that simple. It's easy to paint one side as overly wrong and one side as overly right. Nope, it doesn't work that way. I strongly suggest you all go over to Daniel's site where he actually gets a hold of the legal documents, and come to your own conclusions. Read the facts, not the op/ed pieces, and decide for yourself. In the end, these things speak to your morals. And that's another thing. I've realized that talking creators' rights is the comic book equivalent of talking politics or religion. You'll actually have a handful of people discussing it objectively, and then a multitude of people getting on their high horses. I'm sorry. No. 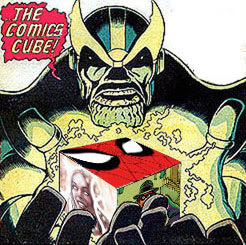 There is no place for that on The Comics Cube. I will always apportion credit to the people I feel properly deserve the credit (meaning still no Bob Kane... sorry, guys, I tried. Batman's a Finger, no matter which way I look at it), but when it comes down to compensation and the actual legal dealings, that's done. You won't see that on The Cube. There will always be extremists who will use strawman arguments on either side. Learn to ignore them, as you would ignore anyone who judges your morals. They will not be budged. I will be going back to basics. The stuff that the Cube was built on were analytical articles about comics as a whole (e.g., The Self-Perpetuating Problem of Mainstream Comics) or specific comics (e.g., Why Nightwing Never Worked), historical articles such as those in my Reclaiming History series, technical articles such as the Comics Techniques and Tricks series, fun stuff about comics like the Easter Eggs, and those that just celebrate certain comics like the ABC Retrospective. These are the kinds of articles I had the most fun writing, so expect to see more of those in the future. Comics should be fun. As Paul Cornish's site always reminds me, this is a hobby for enjoyment. This site was initially meant to give newer readers a place to go to online, without feeling the overwhelming weight of longtime fandom as well as the negativity that pervades the Internet. I am proud of the fact that most Cubers I meet locally have only been reading comics for five years at most, and I will continue to aim at that demographic. But I also hope that you longtime fans who enjoy the Cube are still enjoying it. There you go, folks. A new mission statement. The site's going back to basics, and it's going to be fun. Because comics should be fun. Thanks again to everyone! Here's to at least two more years! We don't see eye to eye on some of your opinions but your articles are always great to read. I'm looking forward to your FCBD coverage for fully booked and I hope to meet you at Summer Komikon. Thanks! Opinions aren't meant to be seen eye to eye on - otherwise they'd be facts! I am only now discovering your blog (looking for a picture). Happy birthday! I love that you mention, several times in this post, that comics should be fun. Just yesterday I was browsing in a comic store I hadn't been in, trying to locate a copy of Ty Templeton's new Spider-man book. In a voice full of disdain I was told that comics for children could be found off in a back corner. Sheesh! At the very least its poor marketing for a comic book store to diss comics that interest kids!! Here's to many more years of entertaining Comics Cube posts. And keep giving us the recommendations from the Cube's Resident Kids. Prof, that's horrible. In my LCSs, they're in separate sections, but at least they're easily located. I will continue to attempt giving recommendations for the kids. Right now, I can't recommend anything Archaia is putting out enough.